Rose water is a perfumed water made from rose petals and water. It is a staple for daily skin care routine for many people. It is said the rose water was used by Cleopatra, one of the most beautiful ladies from the Roman Empire which bears a testimony to the usage of rose water is from a very old age. It doesn’t have any side effect. It is rich in anti-oxidants and has anti-inflammatory properties too. The water helps to tone and moisturise the skin. The magic water also maintains the pH balance of the skin and hydrates the same. Its usage is not only limited to skin but has culinary values too. Rose water can be used as eye drops and because of the antiseptic and antibacterial properties it can be used in wounds as well. 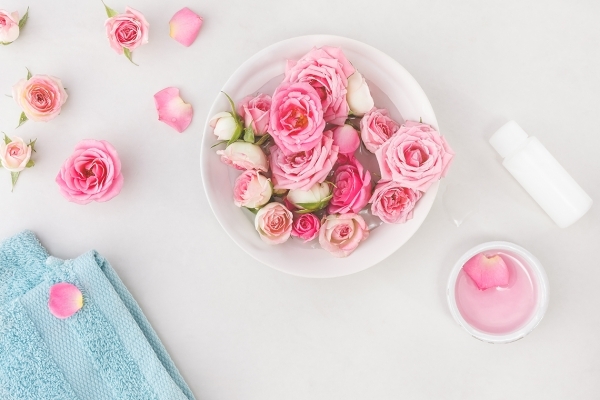 Rose Water and toner with fresh rose petals: It is not at all a lengthy and time-consuming process, it takes only 30 min. The ingredients required are fresh roses and distilled water. So the first steps are selecting some fresh and fragrant rose and wash them properly in lukewarm water. Then remove the petals and discard the rest of the rose; then place the rose petals and water in a saucepan and on medium flame, let the water simmer. Never boil the water; it will destroy the colour and properties of rose. After the water has cooled down, pour only the water in a jar and discard the petals. Store the homemade rose water in the fridge for as long as you want. Rose water with crushed petals: Divide the fresh petals into two parts and crush one part of the petal. Then put the crushed petals and the second part of the petal in one ceramic or glass bowl and leave for 24 hours. Then in a saucepan, let it simmer in distilled water till you see a bubble. Let it cool down and pour it in the jar with the help of a strainer. Let it sit in the sun for a few hours and store in the fridge. Rose water from dried petals: You can buy dried petals from the shop or the best way is to dry fresh petals in the sun at home. Pour the dried rose petals in the jar, add hot water to it and set it aside for 10 to 15 min with the lids on. Then strain the water in a glass jar and throw the petals. Keep the rose water in the fridge. These are some of the different types of rose water we can make at home in just few simple steps. If you want to make rose water for cooking purpose, get the petals from edible roses like Gallica, Centifolia etc.